Having looked back at the industry updates of Micro LED technology, let’s keep on reviewing the technology breakthroughs of Micro LED in the past year. In January, a researcher team at KAIST announced the development of flexible vertical micro LEDs (f-VLEDs). These f-VLEDs achieved optical power density (30 mW/mm2) three times higher than that of lateral Micro LEDs and can be applied to optogenetics for controlling the behavior of neuron cells and brains with wireless transferred power. The same team then introduced a one-time transfer method for its vertical Micro LED and published its achievement on Advanced Materials. According to the research leader, Professor Keon Jae Lee, the f-VLEDs could be applied in portable devices and biomedical applications. Later in August, the KAIST team published a research result showing that its red f-VLEDs can help to regrow hair of mice. The team developed a wearable photostimulator made by a flexible array consisting of 900 red vertical Micro LED and used the device to treat mice with hair shaved. The experiment showed that the Micro LED device has helped mice to grow longer hair in a wider area in comparison with those with other treatment. French semiconductor material provider Soitec developed an innovative substrate called InGaNOX (InGaN-on-X) to enable pure red mission. The substrate has a top relaxed InGaN layer that can be used as a seed layer for full InGaN LED growth. The engineered substrate technology offers innovative solutions for realizing Micro LED full-color display. Optovate, a UK-based optic tech company, introduced a transfer technology and efficiency-improving optics for Micro LED applications. The patterned laser lift-off (p-LLO) transfer technology allows Micro LED chips separation and assembly on target substrate. Moreover, its catadioptric lens arrays can reduce the thickness of LED backlight and fulfill high dynamic range imaging (HDR), stray light minimization, and high brightness maintenance while tuning light output angles. World leading R&D center imec has developed Conformal Structure Method (CSM) for Micro LED chip placement. With spring structure, the approach can transfer Micro LEDs onto different substrates while adjusting the pitches between chips at the same time, increasing the efficiency of transferring and assembly. Peter Lemmens, Managing Director of imec Taiwan, shared with LEDinside that applications including head-up displays or smart glasses will benefit from the technology. JBD, a Hong Kong based technology startup company, has devised a hybrid integration technology to realize monochromatic red, green and blue active matrix Micro LED (AMµLED) displays. 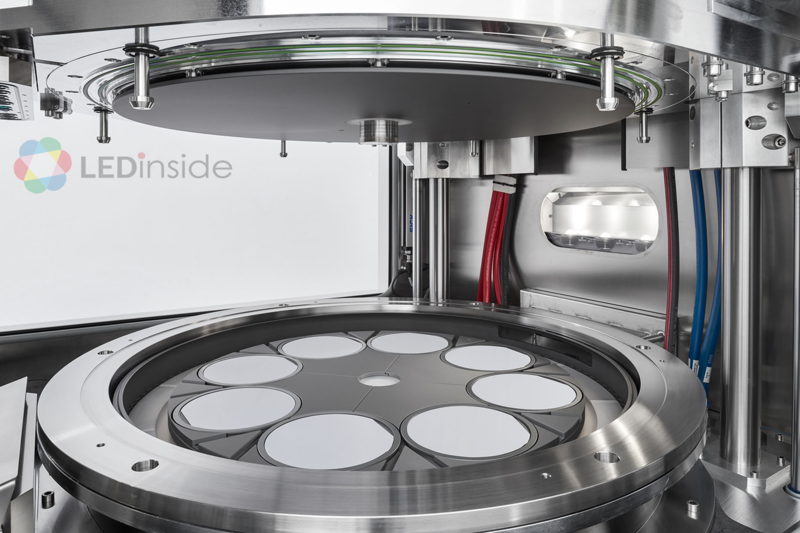 In March, LEDinside had an interview with the company and learned the details about its wafer scale monolithic hybrid integration technology which bounds the LED chips wafer and the IC driver one to create AMµLED displays. Micro LED, with the features of miniaturized chips and massive process amount, requires a different level standard for wafer production and handling process. Therefore, the role of equipment makers in the industry has become even more critical regarding Micro LED production. Leading equipment producers have revealed their strengths for Micro LED manufacturing process in the past year. MOCVD system providers AIXTRON and Veeco have both addressed their ability in producing equipment for the manufacture of high quality epitaxy wafer with higher wavelength uniformity and lower defect density for Micro LED production. Veeco has partnered with ALLOS Semiconductor and demonstrated the reproducibility of ALLOS’ 200 mm GaN-on-Si epiwafer technology on Veeco’s Propel® MOCVD reactor in November. Meanwhile, two of AIXTRON’s systems, AIX G5+C and AIX 2800-G4 TM provide MOCVD solutions to realize high volume production of Micro LED products. The company has illustrated its Planetary Reactor® technology with Gas Foil Rotation® (GFR) as a hybrid solution combining single wafer rotation and batch reactor processing. The technology breakthrough enables wafer temperature control and flow tuning, enhancing Micro LED wafer production. Their development won the Micro LED Research Contest hosted by LEDinside. Kulicke & Soffa has also introduced PIXALUX™, an advanced placement solution for Micro LED and Mini LED which achieved high productivity and yield with ultrafast placement head design and accurate placement on multiple types of substrates while supporting placement of LED and IC dies.